The DeKalb County Community Foundation is pleased to announce the James & Marjorie Lehan Family Scholarship Fund. This newly created endowed scholarship fund will provide an annual scholarship award to graduates at both DeKalb and Sycamore High Schools. Since 1946, the Lehan family has provided care to patients in DeKalb County through their local pharmacy and medical equipment business. Jim and Marjorie, along with their family, have been involved in many community service organizations and efforts through the years. Seeing firsthand how important quality local healthcare resources have become, and knowing the high costs associated with healthcare education, Jim Lehan and his wife Marge felt driven to create a scholarship fund for students looking to pursue a career in a healthcare field. To discuss your philanthropic dreams or to give back to the community by establishing a Fund of your own, please contact Dan Templin, Executive Director, at 815-748-5383. 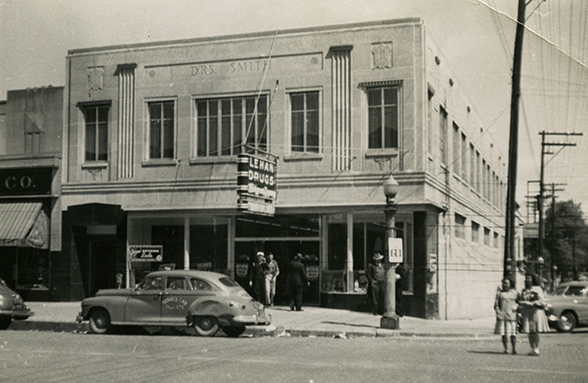 Pictured: The original Lehan Drugs location on the corner of 3rd St. and Lincoln Hwy. in downtown DeKalb, established in 1948.